Welcome to a sun-soaked paradise. Stay with us at The Gates, and discover the history and soul of Key West. Our local touches immerse you in the art of island living, through design, music and, of course, food and drink. But be warned, you might never want to leave! The Gates of Key West is a new upscale lifestyle hotel in Key West Florida, offering sophisticated accommodations and unforgettable experiences. Welcome to DoubleTree by Hilton Hotel Grand Key Resort – Key West, where a friendly staff member is waiting to welcome you with a freshly baked chocolate chip cookie. Everything you need is available in the hotel, from a 24-hour business center to three meals a day served in the full-service Palm Haven Restaurant.Relax in luxury at our first-class Key West, Florida resort. 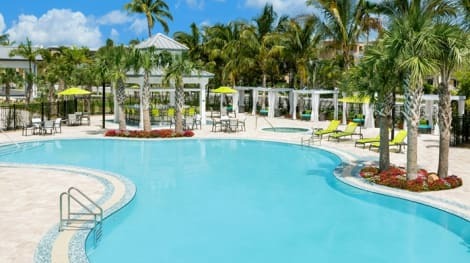 The DoubleTree by Hilton Hotel Grand Key Resort - Key West is perfect for your next tropical getaway to the Florida Keys.Start your day with a delicious Wake Up DoubleTree Breakfast and enjoy complimentary high-speed internet access in your guest room. Upgrade to a superior room and enjoy a superb balcony view that overlooks lush tropical landscaping. The pool features a waterfall, whirlpool, and large sunbathing decks ideal for lounging while sipping a refreshing cocktail from the Tiki Bar. Hold your business meeting or social event for up to 300 guests in one of our seven venues.Stay at our Key West, Florida resort, just 1 mile from Key West International Airport, and take advantage of the complimentary hotel shuttle service to the beaches, the marinas, and downtown Key West. La Concha Key West Hotel Welcomes You to Key West Florida! Discover a rich history, an enviable Old Town location and sun-drenched island charm when you choose the Crowne Plaza Key West - La Concha Hotel. Located on Duval St., La Concha, is the ideal Key West hotel. Guests can enjoy a leisurely stroll to nearby attractions like the Mel Fisher Museum, Hemingway House and Mallory Square. Duval Street offers fine dining, chic boutiques, the hottest clubs in town and iconic bars like Sloppy Joe's. 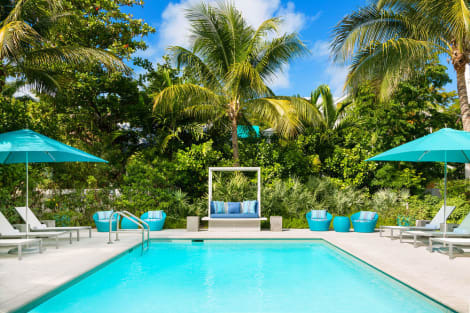 If the walls of our Key West hotel accommodations could talk, they would tell tales of Hemingway writing To Have and Have Not, Tennessee Williams penning lines from A Streetcar Named Desire, and Harry S. Truman talking politics or fishing. Our landmark 1926 hotel offers updated amenities that include free high-speed Internet access, a full-service restaurant & bar, wine tasting and retail lounge, an outdoor pool, well-equipped Fitness Center and rooftop Spa. La Concha Hotel offers warm island hospitality along with everything guests want in Key West hotel accommodations. We celebrate our status as a historic landmark and look to the future with our Palm One status in the Florida Green Lodging Program. For an unparalleled experience, choose the historic La Concha Hotel for your Key West vacation lodging. Grab a bite from the grocery/convenience store serving guests of Fairfield Inn & Suites Key West at The Keys Collection. Relax with your favorite drink at the bar/lounge or the poolside bar. A complimentary buffet breakfast is included. With a stay at Eden House, you'll be centrally located in Key West, a 4-minute drive from Duval Street and 7 minutes from Smathers Beach. 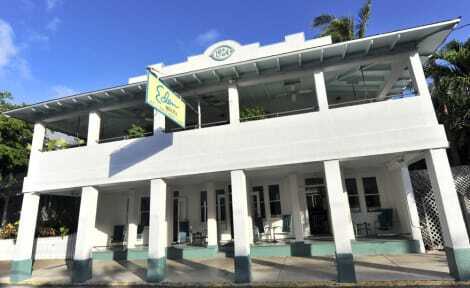 This hotel is 1.1 mi (1.7 km) from Mallory Square and 1.4 mi (2.3 km) from Southernmost Point. 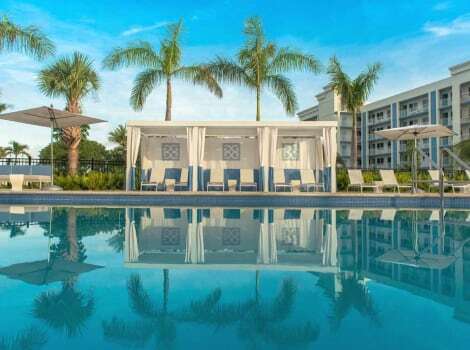 Located in Key West (Key West Historic District), The Marker Waterfront Resort Key West is within a 10-minute drive of Mallory Square and Florida Keys National Marine Sanctuary. This 4-star hotel is 1.4 mi (2.2 km) from Southernmost Point. This is a traditional hotel building. This hotel has a small lobby. Situated at the entrance to Key West on North Roosevelt Boulevard, only 1.6 miles from Key West International Airport, Hilton Garden Inn Key West / The Keys Collection is just minutes from the Key West Historic District, and three miles from Duval Street, Mallory Square, Mel Fisher Museum and the Boardwalk. For a small fee, guests can enjoy a shuttle service to shopping, beaches and tourist attractions including Smathers Beach, Hemingway House and White Street Pier.Feel at home in a spacious guest room at this beautiful hotel in Key West, FL, equipped with a mini-refrigerator, a microwave and a flat-screen HDTV. 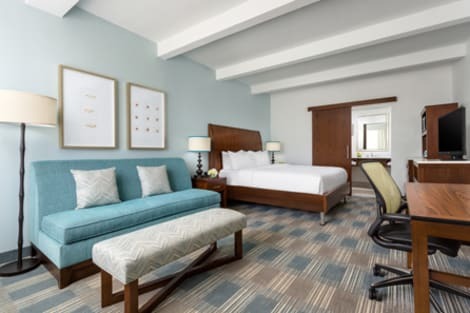 Surf the web with complimentary WiFi at the ergonomic desk, play music through the MP3 alarm clock radio and sleep soundly on the plush Serta bed.Start your day at this Key West, FL, hotel with breakfast in The Garden Grille & Bar; where you can enjoy American cuisine for lunch and dinner. Soak up the sunshine as you sip cocktails in the relaxed Tiki pool bar. If you would rather dine in the comfort and privacy of your guest room, we offer a tempting room service menu (7am – 8pm).Work out with the latest exercise equipment in the complimentary 24-hour fitness center or swim in the inviting outdoor pool. The Pavilion Pantry® is open 8am – 6pm, and stocks a variety of snacks and sundries. Organize an event for up to 20 people in the modern meeting room and print documents in the complimentary 24-hour business center. Make yourself at home in one of the 23 air-conditioned rooms featuring refrigerators. Complimentary wireless Internet access keeps you connected, and cable programming is available for your entertainment. Bathrooms have designer toiletries and hair dryers. Conveniences include safes and desks, and housekeeping is provided daily. With a stay at Albury Court Hotel - Key West in Key West (Key West Historic District), you'll be a 2-minute drive from Duval Street and 6 minutes from Smathers Beach. This hotel is 0.9 mi (1.5 km) from Mallory Square and 1.3 mi (2.1 km) from South Beach. Enjoy recreation amenities such as an outdoor pool or take in the view from a garden. Additional features at this resort include complimentary wireless Internet access, concierge services, and a picnic area. Make yourself at home in one of the 37 air-conditioned rooms featuring LED televisions. Complimentary wireless Internet access keeps you connected, and cable programming is available for your entertainment. Bathrooms have showers and hair dryers. Conveniences include safes and complimentary newspapers, as well as phones with free local calls. lastminute.com has a fantastic range of hotels in Key West, with everything from cheap hotels to luxurious five star accommodation available. We like to live up to our last minute name so remember you can book any one of our excellent Key West hotels up until midnight and stay the same night.